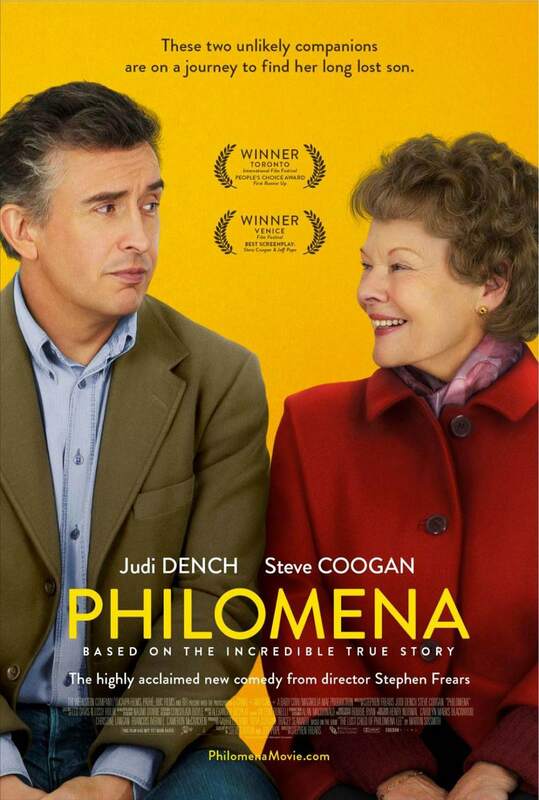 Yesterday, I had my fill of turkey, and today I saw “Philomena.” They both hit the spot and made me all feel warm inside. This is the true life story of Philomena Lee (played by Judi Dench from “Skyfall”), a young girl in Ireland, who went to a carnival and came home with the boobie – I mean, baby prize. Her father was so ashamed he turned her over to the nuns at the local convent. The deal was the nuns would take care of her and birth the baby. All she has to do is work for them for four years and sign over all rights to the child. As young girls did in those days, she gave up her son so that he could have a better life, but not until she raised him for his first three years. The severity of the sin and the need to keep the secret is pounded into her by the nuns. It’s a shame that such a thing was so shameful. Eventually the secret itself becomes more of a sin. Now, 50 years later, on her son’s birthday, she finally opens up about him. Philomena enlists the help of Martin Sixsmith (Steve Coogan from“Percy Jackson & The Lightening Thief”) to help find him. Martin has just been sacked (love that British expression) and has nothing better to do than stretch his journalistic legs on this adventure. Martin follows the trail to America with Philomena in tow. Watching him endure hours of non stop talking made me miss my Mom. Before this he never thought much of human interest stories, and now he is consumed by one. There is a lot going on here; the way the Catholic Church handled these things and the way society viewed un-wed mothers. Although, if there had been an abortion, the movie would have been over before I finished my popcorn. Judi Dench gives the kind of performance we have never seen from her. To see such a strong woman be so vulnerable because of this one secret is very touching. She does not blame the Catholic Church or the nuns. She accepts the responsibility and the pain that comes along with it. The ending got to me, but then so did the beginning and the middle. I thought I was going to keep it together, and then…Niagara Falls. I give this movie 4 stars out of 5. Now, I just wish my mom was still around to talk about it.